For one day long, the town square in Brixen (in Italian: Bressanone, in Ladin: Persenon (Gherdëina dialect) or Porsenù (Badia dialect)) in South Tyrol radiated multilingualism: on Friday 21 June 2013 it was here that the European Citizens’ Initiative and the Minority SafePack for diversity in Europe was started. The team made sure that there was action and that the 300 visitors had fun. Not only was the action attended by the participants of the FUEN Congress, but also by passers-by and tourists from Brixen. In more than 10 languages the slogan “You are not alone. One million signatures for diversity in Europe” was shouted out, while the balloons went up into the sky, in a symbolic way announcing the news of the initiative to the whole of Europe. 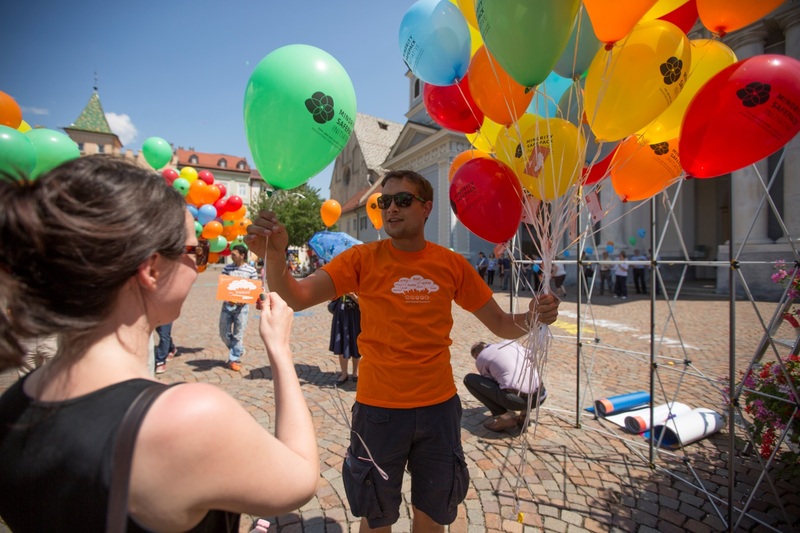 We were supported by the young people from the Youth of European Nationalities (YEN) and Südtiroler Jugendring, by the South Tyrolean People’s Party (SVP) and the Federal Union of European Nationalities (FUEN). Without their active support such a successful action would not have been possible.